He has received no post for over a fortnight, presumably as a result of the Royal Mail stoppage, and is anxious to let any would-be supporters of 82045 know that the problem does not lie with the Fund. Please accept Chris's sincere apologies and contact him if you are wondering where he learned his manners! The problem with Chris's mail deliveries has now been identified, and we understand that an individual has been arrested. Chris has been told that some of the missing mail has been recovered, and that this should be delivered to households affected in his part of Cheshire by mid-December. Mail deliveries are otherwise back to normal, so anyone wishing to contact him by letter can do so without worrying that it will not be received. 25th November marks the first anniversary of the arrival of 82045's frames at our site at Bridgnorth after drilling at Boro' Foundry, since when the project has continued to make great strides. Attention has been focused on building the frame assembly, and to this end virtually all the frame stretcher components have been obtained or are on order and expected imminently. 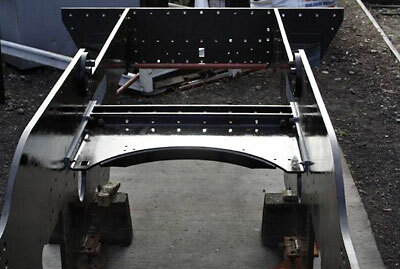 Only the firebox support bracket awaits casting, and a quote of £6,355 was obtained in the summer for the substantial smokebox saddle fabrication. This would have been ordered by now but for our unexpected purchase of the firebox copper, with member Rob Barlow kicking off the action by donating £355-00 towards the saddle, leaving £6,000 to be raised. Any offers of further help towards the acquisition of this spectacular piece of locomotive will be gratefully received. Some of the stretchers are already in situ on the frames (see photographs), while others - including the front and rear radial arm supports, from which the pony trucks depend - are undergoing machining and drilling in the workshops and are virtually ready for mounting. 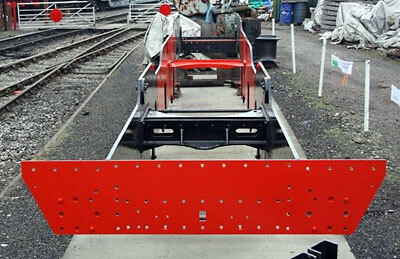 Front and rear buffer beams are mounted temporarily pending drilling of the gusset brackets, while the buffers themselves are undergoing refurbishment. The frames have been given several coats of paint - two coats each of primer, undercoat and top coat - and are ready to withstand the looming winter. On the pattern front, Brian has been very busy and has finished the patterns and coreboxes for the driving wheels (on display in The Engine House), horn blocks, horn guides and firebox support bracket. Many thanks to all concerned for their splendid efforts over the past twelve months. 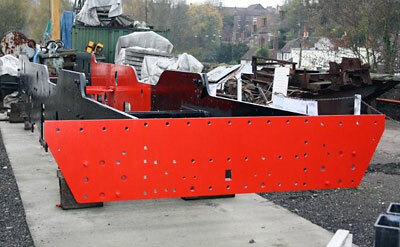 We've continued with the machining and fabrication of the various frames stretchers as the photos on the right show. Before the year end we expect delivery of the components bent to shape of the front pony truck centre and frame stay and the rear pony truck centre and frame stay plus two bunker support brackets. We will then have to complete the fabrication of these items followed by machining and drilling. We also expect to receive in the near future two vertical stretchers from Sheffield, largely complete except for machining to size to fit between the frames. Following some minor damage sustained when 41241 was off-loaded for the gala, this has led to the manufacture of a pattern for a sand trap body to allow replacement of the broken one. Coincidentally identical to those required for 82045 - it's an ill wind! 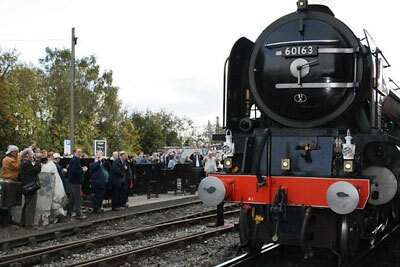 Crowds flock to see 82045's frame assembly at Bridgnorth. Ok, the loco on the right may have had something to do with this! Two views over the frames with the rear buffer beam - now in top coat. 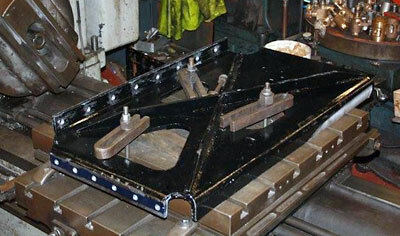 A horizontal stretcher partly machined on the table of the horizontal boring machine. This stretcher fits behind the brake cylinder support stretcher, already fitted. These two stretchers, standing on end, are the rear radial arm support stretcher (left) and the front one. In each case a king pin for the arms of the pony truck fits through the large hole in the centre of the structure into a U shaped strap bolted underneath. Some further work remains to complete these before they are fitted to the frames. 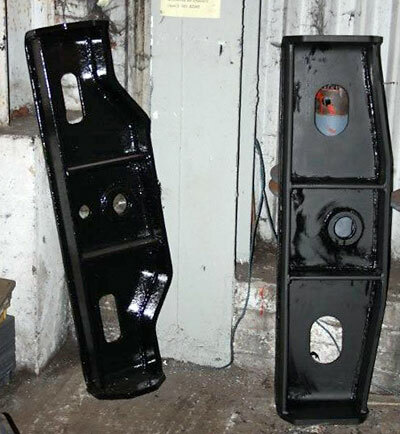 Following machining and painting another of the rear stretchers bolted in position.